Caramel Oatmeal Cookies are such delicious cookies. 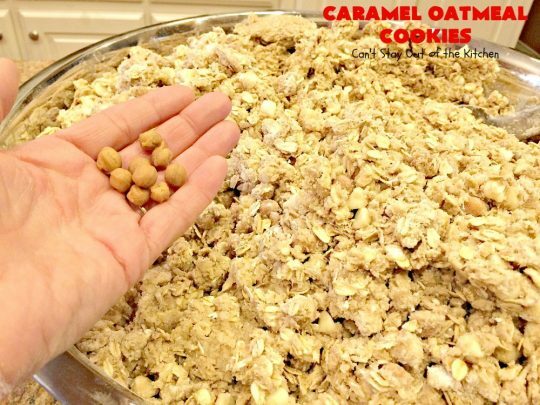 There are loads of caramel bits, vanilla chips, oatmeal and cinnamon in each cookie making for one fantastic combination of flavors. I bought several bags of the Kraft caramel bits a while back and I wanted to use them up with some Christmas cookies. 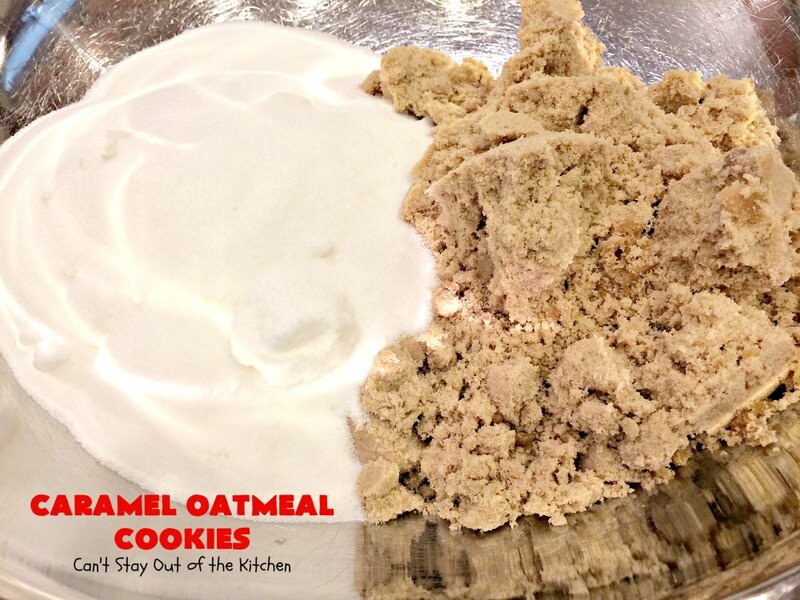 These cookies were the perfect option. 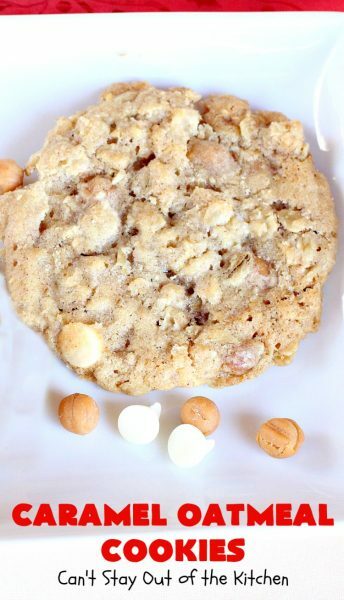 I went back to my Cinnamon Cookie recipe, but instead of adding icing on top, I substituted caramel bits and vanilla chips in the cookie base itself. They turned out delicious, uh, decadent, uh sinfully rich. Yes, they were truly amazing. 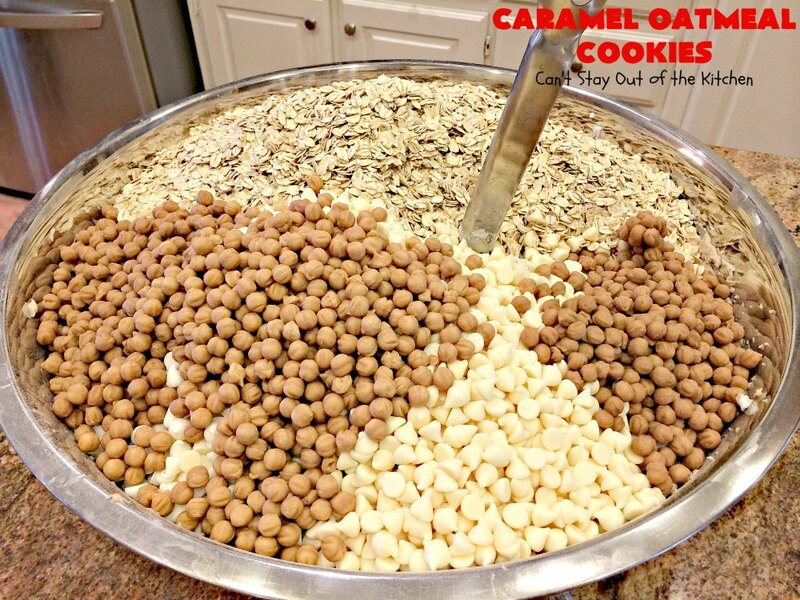 Adding caramel bits to the batter is a little bit like adding caramel morsels or chips – the same concept except they have a rich, caramel flavor. 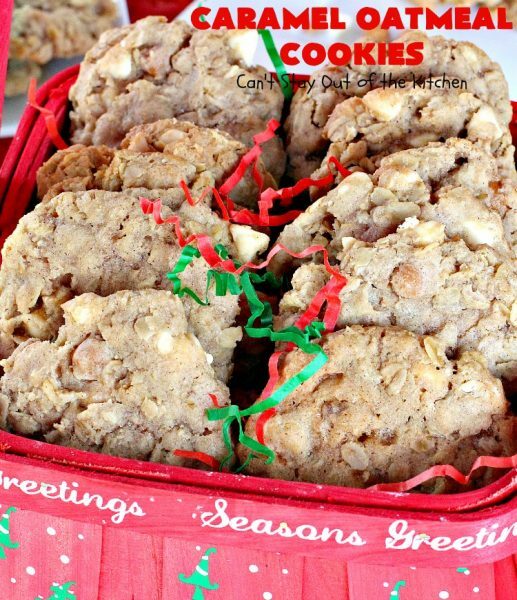 These wonderful cookies made our Christmas Cookie Extravaganza list this year. 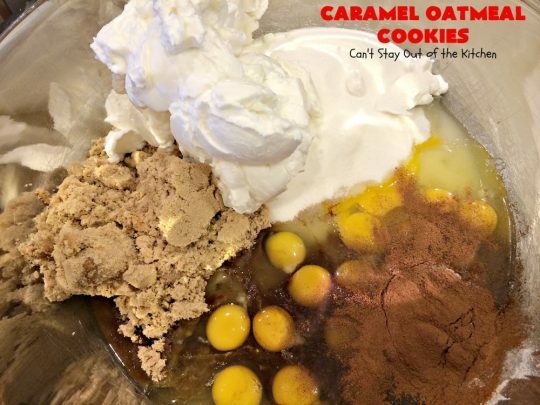 I was about a third of the way through my cookie baking when I made this batch which contributed to our final count of about 4,500 to 5,000 cookies for 2013! 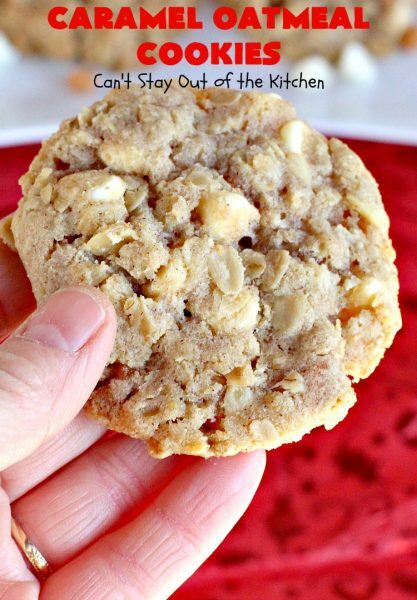 If you’re looking for a dynamic Christmas cookie recipe to bake for holiday parties, cookie exchanges, or family gatherings, then check out this divine cookie. 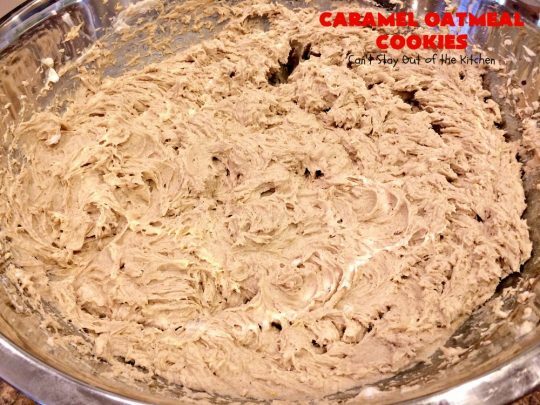 But you better make a double batch or you may not get any! 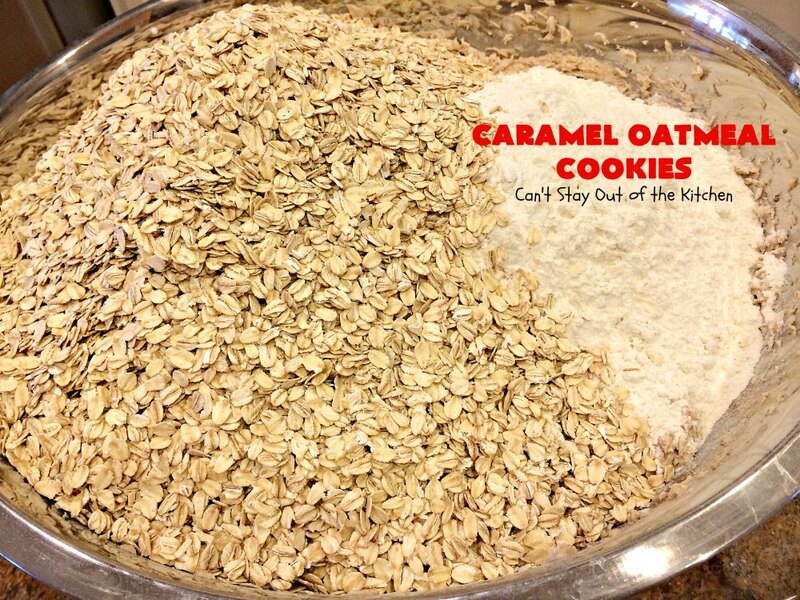 Caramel Oatmeal Cookies are very rich since they have both vanilla chips and caramel bits in them. Yeah, I did it. 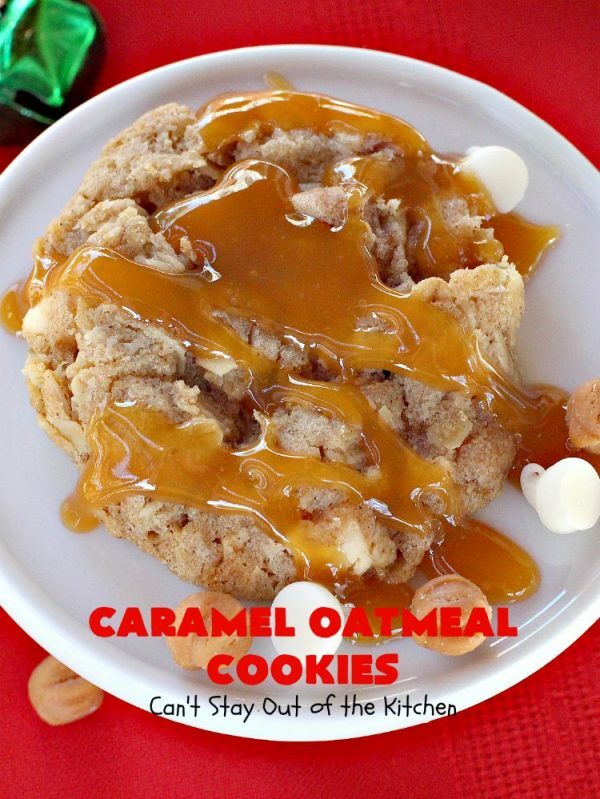 I made a sinfully rich cookie even more so by drizzling caramel sauce over top. Caramel Oatmeal Cookies are loaded with caramel bits and vanilla chips. Yum. 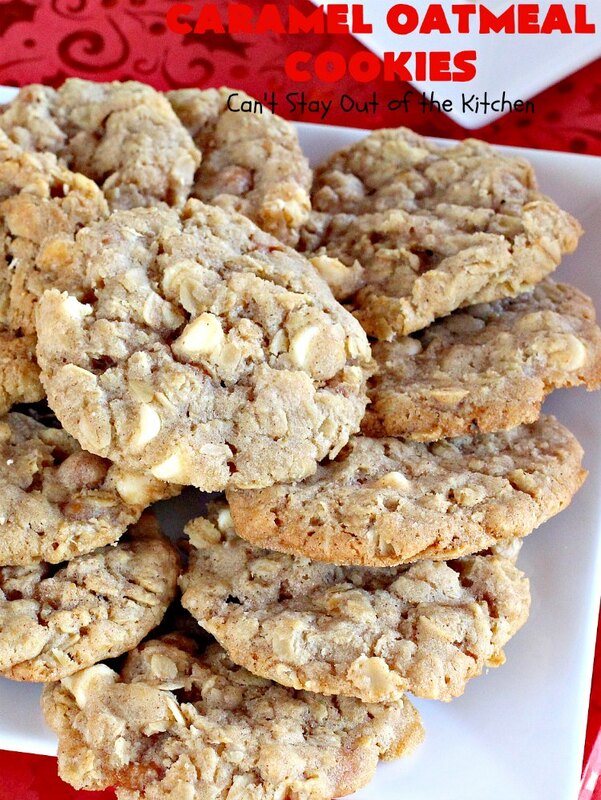 These cookies have a nice texture as well as great taste. 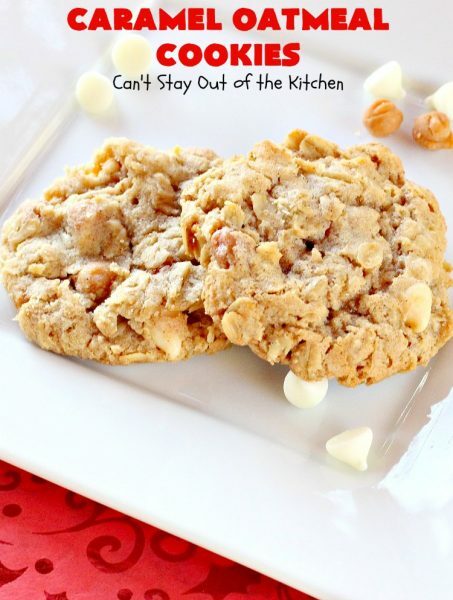 If you like caramels you will love these cookies! In a large mixing bowl place sugar and brown sugar. Don’t freak out at these amounts. I was making six batches of this recipe. 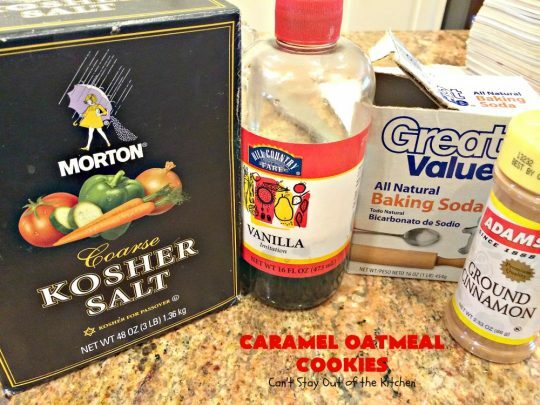 Add salt, baking soda, cinnamon and vanilla. Add oatmeal and UNBLEACHED all-purpose flour. Bleached flour toughens baked goods. 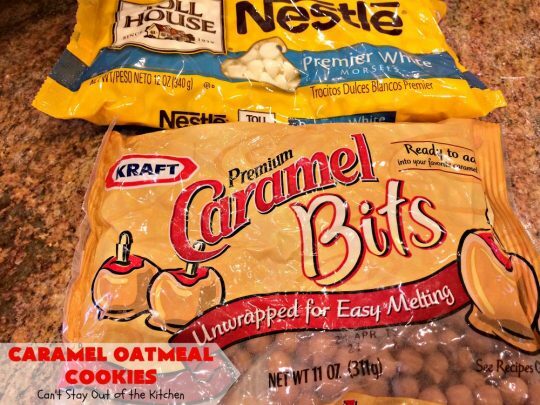 Add a bag of caramel bits, and a bag of white vanilla chips. Yes, I was using a mammoth commercial-size bowl. Stir ingredients to combine. Here’s what the caramel bits look like. Almost like chips and morsels, but shaped differently. Spray baking sheets with cooking spray. Roll mixture into balls. I had to keep my hands very moist in order to make this happen. I started using a fork to press the cookies down slightly. But it actually worked better to press the cookies down with the palms of my hands instead. Bake at 350 for about 12-14 minutes. My oven may take longer than yours because I was baking 4-8 racks at once. (4 racks in each oven). Caramel Oatmeal Cookies are heavenly tasting. Each bite is mouthwatering. 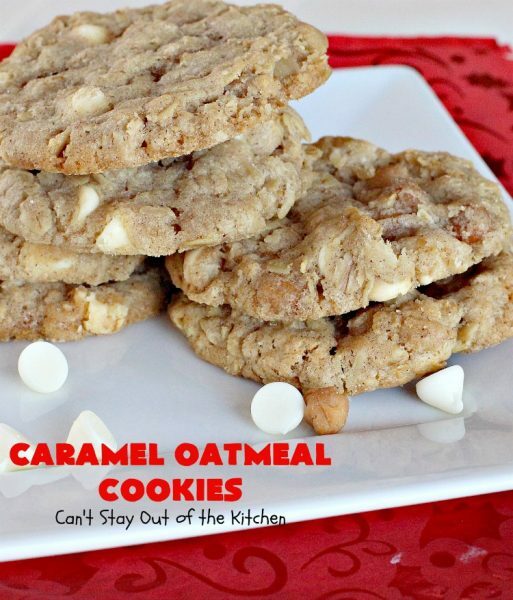 Caramel Oatmeal Cookies are a great cookie for holiday baking. 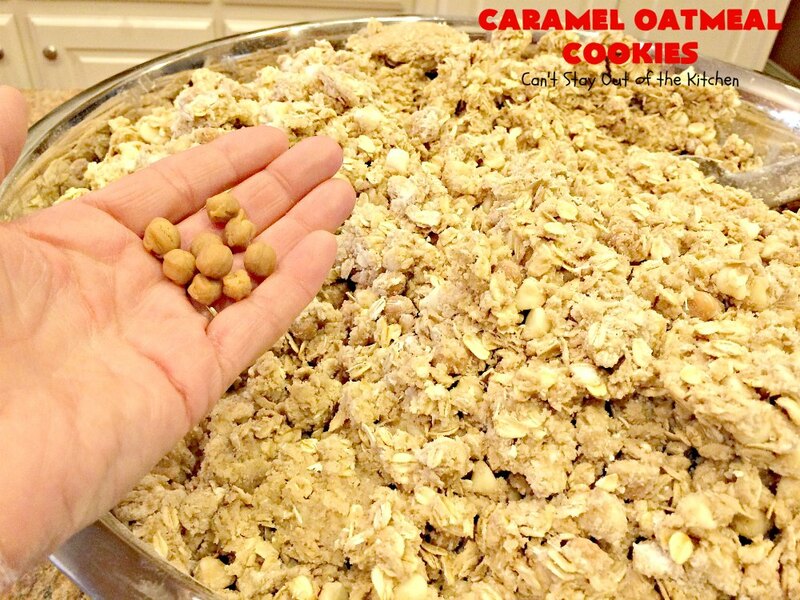 Why don’t you make up a batch this year? 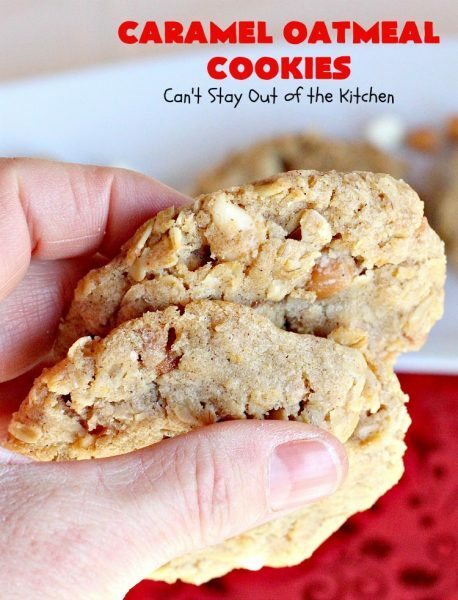 These luscious, decadent oatmeal cookies are made with caramel bits, vanilla chips and cinnamon. 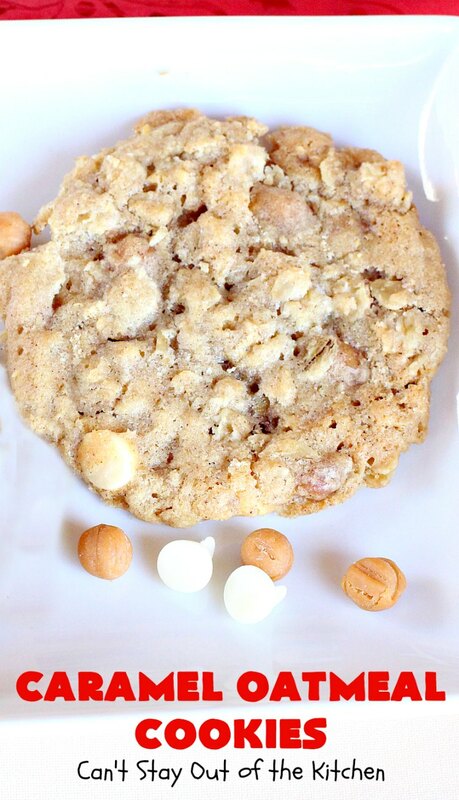 They are sinfully rich, decadent and delicious! They're also perfect for holiday baking and Christmas cookie exchanges. Mix shortening, sugars, eggs, vanilla, cinnamon, baking soda and salt with an electric mixer until well mixed. 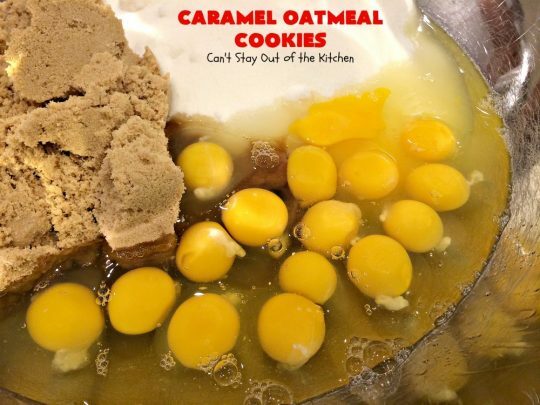 Stir in flour, oatmeal, vanilla chips and caramel bits with a wooden spoon until combined. 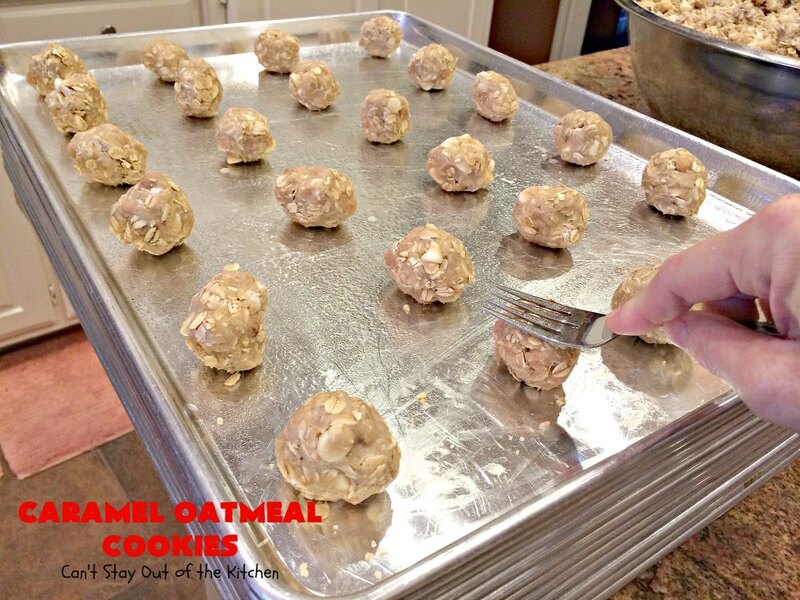 Form into balls, lay on greased cookie sheets, press lightly with a fork or your hands. Luscious, decadent oatmeal cookie made with caramel bits, vanilla chips and cinnamon. Very rich. This dough works better by rolling and compressing it in your hands to form balls rather than using an ice cream scoop or dropping the dough on cookie sheets. The compression helps keep all the ingredients together. I had to keep my hands wet for this to work easily. Nothing like a little caramel sauce to increase the flavor! 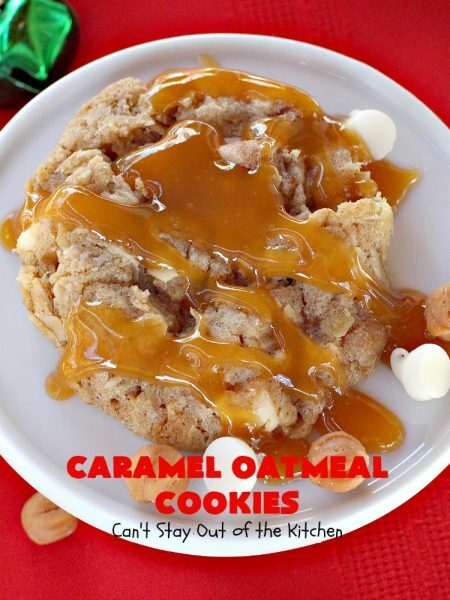 🙂 Now if you really want dessert add some caramel and a dollop of ice cream! Caramel Oatmeal Cookies turned out spectacular. Take a plate to your office and soon they will all be gone, gone, gone! Caramel Oatmeal Cookies will make you drool big time!